Welcome to another look back at a week in TV in which I gave some second and third chances to a couple of shows that I'd previously turned my back on. One such drama is Peaky Blinders, a series that on the surface I should love as it is brilliantly stylish and is incredibly dark. But there was something about Steven Knight's Birmingham-based gangster period drama that left me cold and meant that I only managed one or two episode of the first two series. However as the show has won plenty of critical acclaim I endeavoured to give it yet another go around and as luck would have it the iPlayer offered a ten minute long catch-up of the first two series. 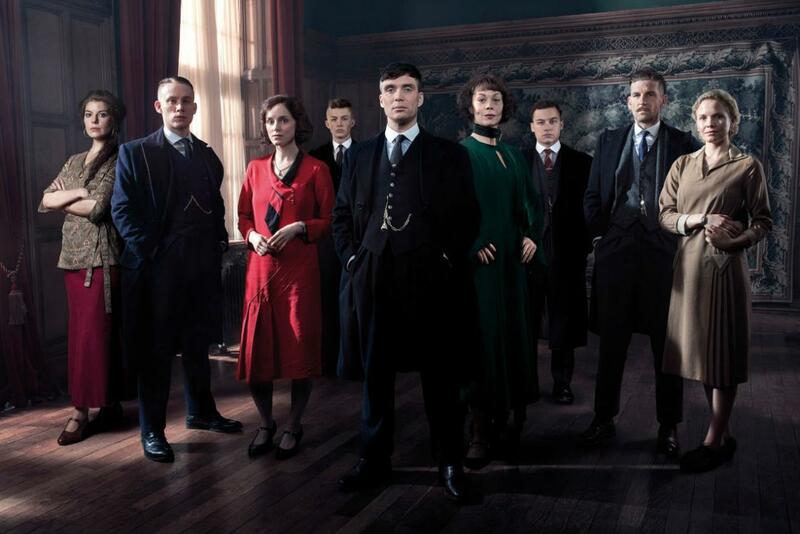 As I felt I was pretty much caught up I tuned in to see the events that took place two years after the series finale which saw the life of Thomas Shelby (Cillian Murphy) saved by men working for Winston Churchill. As this run begun it appeared as if Thomas and his fellow Peaky Blinders had gone up in the world as he seemed to be the groom at a rather opulent wedding celebration. It transpires that Thomas ended up marrying former undercover cop Grace (Annabelle Wallis) whose family have attended the wedding in full military regalia. The discrepancy between the two clans is brilliantly represented through a long shot in the church we sees Grace's dignified family sitting across from the extended bedraggled Shelby brood. What I did like about this opening episode was the way in which Knight mostly kept it focused on the evening celebrations at Grace and Tommy's wedding. At the same time we learned of some of the themes of this series such as dealings with the Russians and the Shelby's Aunt Pol (Helen McCrory) being pursued by the mysterious Reuben Oliver (Alexander Siddig). As you would expect nothing went particularly to plan despite a rather rousing speech given by Tommy to his cohorts informing them that there was to be no violence on that night. But Peaky Blinders was never going to return without any violence and in fact the final act of this opener was full of bloodshed. From the predictable bare-knuckle fighting between The Shelbys and Grace's family to the rather brutal murder of a Russian agent at the hands of Tommy's brother Arthur (Paul Anderson). Although I think a lot of the love for Peaky Blinders is due to these arty violent sequences for me it was the quieter moments that provided the standout moments. I personally loved Arthur's drawn out best man speech for his brother that was eventually quashed after several agonising moments. Similarly I enjoyed any time the scheming Pol was on screen as she attempted to paint a smile on her face despite not liking Tommy's new bride at all. Part of the reason I love the Pol scenes so much is due to the performance given by the brilliant Helen McCrory who attempts to chew the entire set as the ballsy Shelby matriarch. Murphy meanwhile is as enigmatic as ever and delivers all of his lines in such a way as to explain why as many men want to follow Tommy as they do. However I think I was most impressed by the turn given by Paul Anderson as he made Arthur the real star of the show, less flashy than his brother but more willing to get his hands dirty when the time called for it. 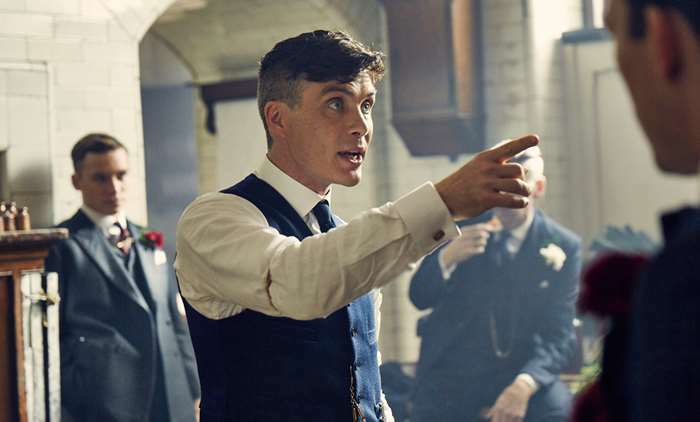 Despite enjoying both the majority of the writing and the performances I still feel a certain distance from Peaky Blinders that stops me from fully engaging with it. I do think my problem lies in the style of the show with the bleakly painted landscapes and modern music choices making Peaky Blinders feel more like a graphic novel adaptation and less like a period piece. Whilst I think the majority of the show's fans love the modern take on the 1920s setting I think it's what I find most alienating about the show as I find it hard to buy into the characters due to the almost comic book backdrops. While I don't think Peaky Blinders suffers from a style over substance problem I do believe that it's the presentation of the show that I find the most off-putting. I'm sure most people will disagree with me here but I think I would've enjoyed Peaky Blinders a lot more if it had been presented in a more stripped back style. That's not to say I didn't enjoy the show and there were moments where I pondered whether I should go back and start the show from the beginning. However once the cavalcade of violence began I realised the reason I'd stayed away was because Peaky Blinders was prone to moments of excess that weren't particularly warranted. Although I can more than see why other people like this unique take on the British gangster saga I'm afraid I can't see myself tuning in to another episode despite the promise of both the returning Tom Hardy and Paddy Considine. So I'll have to apologise to Tommy and the rest of the Shelbys and say that I won't be sticking around to see how they get out of their next scrape even though I am a little intrigued to see just how Winston Churchill wants to utilise the service of the Peaky Blinders. Whilst Peaky Blinders was a show I thought I would take my fancy, I knew from the first moment I switched series one of In the Club on that it wouldn't be for me. Despite finding little merit in the opening episode of series one I felt it was my duty as a TV writer to give In the Club another go. The main problem that Kay Mellor's pregnancy drama faced in its second term was the fact that all of the primary characters had already given birth last time. Therefore, I wasn't surprised to see that both schoolgirl Rosie (Hannah Midgley) and married couple Jasmin and Dev (Taj Atwal and Sacha Dhawan) were already expecting again. Jasmin received devastating news early on in this episode when she discovered that there could be problems delivering the twins that she was expecting. Meanwhile Rosie had to deal with being pregnant whilst organising the christening of her one-year-old daughter whilst surrounded by the series' other main characters. Rosie also has a tenuous connection to this year's newcomers mother and daughter Maxine (Sandra Hugett) and Shelly (Gemma Dobson). While Shelly is acting as a surrogate for a gay couple, Maxine also springs into the story when she finds a newborn baby in the toilet. I'm not sure if Mellor has already made it obvious to the audience that it was Maxine who gave birth to the baby but if this was meant to be a surprise in an upcoming episode then it wasn't a very surprising one. There were also dilemmas for the mothers who weren't expecting again such as blogger Kim (Katherine Parkinson) who hadn't allowed herself any time away from her newborn to the extent that it was effecting her relationship with her new man. Highly-strung businesswoman Roanna (Hermione Norris) was also struggling due to the fact that the abode she was sharing with her young toyboy was falling apart. Possibly the biggest reason for me tuning out of In the Club after episode one was the daft story involving Diane and Rick (Jill Halfpenny and Will Mellor) in which the latter was arrested after committing the world's worst armed robbery. I think then part of the reason I enjoyed In the Club more this time around was that those two characters were sidelined for the most part but we did receive the terrifying news that Rick will more than likely be out of prison before the end of episode two meaning that my enjoyment of In the Club may be over before it begins. It's fair to say that I think this episode of In the Club flowed pretty well for the most part even if I don't think all the characters were given that much time to shine. In particular I felt that midwife Vicky (Christine Bottomely) hardly got a look in and all we were given was a minute or so explanation to why she had become a single mum since series one. I do have to applaud Mellor as she does no how to execute a dramatic set piece as was exemplified at Rosie's baby's christening where Kim came face-to-face with her former partner's new lover. The final scenes were also well done in which Rosie's waters broke while she was trapped in a lift with her children's father as they were about to embark on a new life together. I do feel that Rosie is the character that I sympathise with the most here and that was my thought the first time round too. It appears as if Mellor really wants to tell Rosie's story and actress Hannah Midgley is so great at portraying the schoolgirl that it's hard not to like her. I don't know why Mellor insists on telling multiple stories in both In the Club and The Syndicate but it's really frustrating as for every one gripping plot thread there's three or four that you just don't care about and therein lies the problem with the drama. Whilst I enjoyed the show when Rosie was on screen I just couldn't bring myself to care about Kim, Roanna, Diane or Rick. Even though I'm a big fan of actress Sandra Huggett I think she's been ill-served by both quite a clichéd character and a plot that isn't as clever as it thinks it is. In fact, aside from Rosie the only characters who I cared about here were Jasmin and Dev. Again this is partly due to the performers but also because everything about the reaction to their baby news rings true. Unfortunately the fact that Mellor seems to want to tell everyone's story simultaneously makes In the Club a little dull if you're not fully invested in every single person. Whilst there are some elements of the show regarding both the acting and the themes raised there was just so much going on that it was hard to care about anyone. Even though I say this I know that this series of In the Club will be as popular as the last one was and Mellor will probably continue to make these sort of multi-stranded dramas as long as the BBC wants her to. However I'd like her next drama to concentrate primarily on just one protagonist rather than six as then I might finally be fully engrossed in something that Mellor has created. 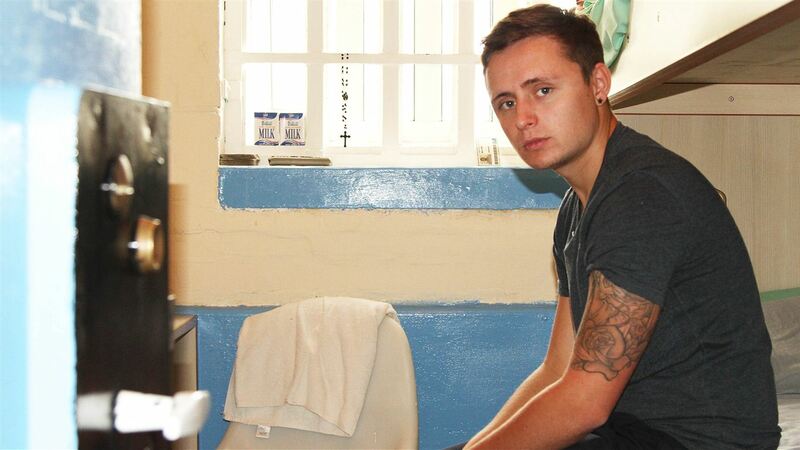 The words thought-provoking documentary and ITV don't go hand-in-hand very often but the channel have always stepped up when it comes to looking at this country's prison. However ITV have been doing documentaries about some of our most notorious institutions for so long that it's hard to find a new angle on being a prisoner. But somehow the team behind Her Majesty's Prison: Norwich found one by looking at how being locked up for a long stretch affects many of the young fathers in the facility. For the majority of the programme we saw the prison through the eyes of affable Nick Grady who was serving quite a long stretch for a drugs-related crime. Nick's latest arrest came just after his youngest child was born and as we see his children visit it becomes evident how normal seeing their dad in prison is to these kids. It was interesting to me to see how the prison allows men like Nick access to their families in a number of ways including a scheme in which he is allowed to record himself on tape reading bedtime stories to his son. However the documentary also showed how not every visit in the prison has the most innocent of intentions as we met the female guards in the mailroom whose job it was to sort the genuine love notes from the parcels of heroin. One of the documentary's best elements was the fact that they picked the right characters to follow including Liam who started serving a twenty-month sentence after buying a stun gun online. Liam thought he'd just get off with a slap on the wrists as he didn't realise what he'd done was illegal and now he was paying the price for his stupidity. The film showed the first visit he had with his mother and girlfriend both of whom looked shocked to see him and I think this perfectly summed up a lot of the feelings families have when one of their own is banged up. I think the general tone of Her Majesty's Prison: Norwich was seeing that not all that goes on in prison is violence and that there are several schemes in place to try to rehabilitate long-time convicts and stop the endless cycle of arrests. For example the reward and punishments of work detail were revealed through the character of Rocky who saw his privileges taken away after being sacked for stealing. I was also intrigued by the fact that Nick was designated the role of guide to first-time prisoners as they tried to get their bearings in Norwich. All together I thought this was another solidly put together piece of documentary film-making from ITV who don't get always get the credit they deserve for their factual output. Finally it's another week and we have another Channel Four comedy but thankfully there were more laughs in The Windsors than there were in the frankly bizarre Flowers. The Windsors comes from team behind the long-forgotten Star Stories and imagines the royal family as the stars of a Dallas-style soap opera. Obviously some of the jokes are quite obvious such as everybody fawning over Pippa Middleton's arse and Fergie (Katie Wix) being a complete embarrassment to the entire royal family. However there were some gems among the myriad of gags most notably the Middletons gypsy heritage which Kate (Louise Ford) is still proud of to this day. The bizarre soapy elements of The Windsors also lend a sense of ridiculousness to the show which is keen to demonstrate the fact it doesn't take itself too seriously. The main thrust of the plot is that Charles and Camilla (Harry Enfield and Haydn Gwynne) are worried that the line of succession is going to skip a generation as Wills and Kate are much more popular than they are. Camilla's plot to take down Kate by getting her to dress as a pirate during a military amputee ball was an inspired gag as is the central plot thread of the Duchess of Cornwall attempting to have another child. Other highlights included Harry (Richard Goulding) not being able to differentiate between the many blondes he's been linked to and Wills' (Hugh Skinner) need to become a helicopter pilot again. But my favourite characters was the frankly clueless sisters Beatrice and Eugenie (Ellie White and Celeste Dring) who attempted to start an online make-up tips business to make some much needed cash. 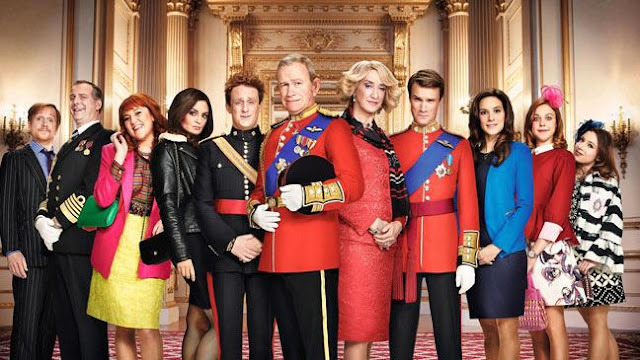 Although The Windsors didn't always hang together it did a good job at both creating larger-than-life versions of our royal family and at the same time staying true to its soap opera spoof style. The majority of the cast looked like they were having a good time and I was particularly fond of W1A's Hugh Skinner's performance as the affable William who tried to balance his duty with his love of flying. In fact the only person who slightly spoiled the show for me was Morgana Robinson who, despite being a fine impressionist, was a bit out of place here in her role as Pippa Middleton. While nobody should go into The Windsors expecting the next big comedy hit it's good to have a bit of satirical fun on the box once in a while. Additionally I feel thatChannel Four have definitely made the right decision by putting it on on a Friday night when you just need a couple of cheap laughs to relax yourself into the weekend. Well that's your lot for now, I'll be back next week for more of the same and in the meantime please follow me on Twitter @mattstvbites where I'll share more of my views on TV.